Academia de Cruz Medina: Machete Viene! 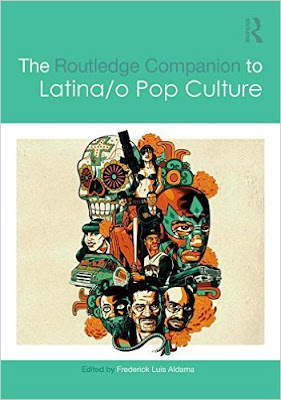 Edited by none other than the prolific Frederick Luis Aldama, this collection The Routledge Companion to Latina/o Popular Culture includes examinations of expressions of Latin@ culture across various mediums of pop productions. They say don't judge a book by its cover, but they lacked semiotic depictions at the level of this beautiful design. My chapter is on the pop expressions of Dia de los Muertos (or Pop de los Muertos), focusing on such recent films as the Book of Life, while paying homage to Romero's Dead Series.